Favorite games from the 8-bit era and beyond, now with slick, Mac-friendly functionality wrapped around them. Here’s how it might look actually playing those games. Fans of vintage games with Macs, take note. Open Emu makes emulation of classic game systems a “first-class citizen” on the Mac. But if it were just a game emulator, well, it wouldn’t be news. What makes it news is that at its core, Open Emu is an open source platform and modular architecture into which your favorite game systems can be added as plug-ins. And thanks to that architecture, you can treat your favorite game systems as though they’re modules in a grand, 8-bit modular visual synth, crunching their textures into geometry, adding real-time effects, and controlling the whole thing with multiple controllers, audio, and MIDI. In other words, Open Emu is like having a giant visual performance synth made from the tasty innards of classic games. The platform has been in feverish development for some time, but today a major new release takes it further. Beta 2 of 1.0 extends the modularity of the platform, adds a finished Quartz Composer interface (allowing integration with other apps, live visuals, and graphical, modular patching using Apple’s development tool), and adds more emulation cores. Game emulation is nothing new, but the programming team has build a friendly Mac front-end for a host of mature, popular emulation engines. They also fully support Mac technologies, even third-party niceties like Sparkle for automatic updates. Where that modularity gets really interesting is in the Quartz Composer form of Open Emu. Here, you can apply textures to a cube, modify them with effects, cheat and rewind your way around the game, glitch out the cartridge — eventually make a live visual performance out of game textures with live gameplay and control input. 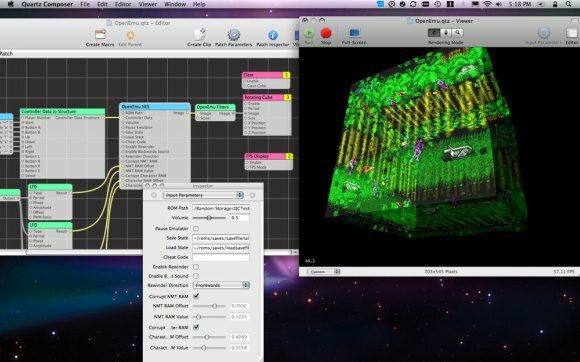 In other words, you can jack in your favorite MIDI controller and go nuts with your favorite games, turning them into a live performance medium – then mashing up the resulting textures with real-time, 3D/2D effects. The Nestopia engine supports ROM glitching, cheat codes, and game rewinding — essential so that in-game death doesn’t also kill your set, and so you can play with the aesthetic of glitchy cartridges without blowing on a classic game cart. Anton Marini, CDM contributor and a member of the development team, sends over some demos of what the Quartz Composer features can do. These are a bit older, but they give you a sense of the functionality inside. OpenEmu QC Demo 3 from vade on Vimeo. OpenEmu QC Demo 2 from vade on Vimeo. And, finally, putting it all together, exposing the “power patch” for the emulator Nestopia, with cheat codes, game rewinder, and glitches in the character and video. I imagine this sort of work could be applied to mashing up other software, or to emulation on other operating systems – though certainly the graphics architecture of the Mac makes it uncommonly easy. Of course, because of the modular approach here, this really just scratches the surface of what you might do in a performance. I look forward to seeing what folks come up with. If you do find a way of rigging this up in performance, do share — remember, bragging rights come from finding a way to play all the Mario games at once from one joystick and turn it into a flowing live landscape that reacts to your friend’s Norwegian death metal band. Congratulations to the development team: Anton and Dan on the Quartz Composer work, Anton on the OpenGL work, and lead programmers Josh Weinberg, Ben Decavel, and Remy Demarest!